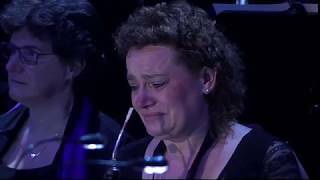 This musician thought she might never be able to play her instrument again, but then she made it through this heart-wrenching performance of ‘Schindler’s List’. Cor anglais player Davida Scheffers has a painful neuromuscular condition which disrupted her career as a musician. Despite her fear that she might never be able to play with a professional orchestra again, Davida’s dream was to play with the Netherlands Symphony Orchestra. And last year, she managed it. In a performance with the orchestra, Davida managed to play the entire cor anglais solo from John Williams’ Schindler’s List, before bursting into tears during Simone Lamsma’s solo on violin. It was a powerful moment that affected both the audience and orchestra. Look out for Davida’s daughter in the audience, who had just turned 18 that day. Well done, Davida – what a remarkable achievement!